Welcome to the on-line Research Room of the Heart O' Wisconsin Genealogical Society! This page is the gateway to the research material 'owned' by HOWGS that is available on-line. 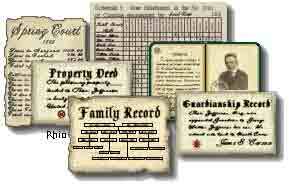 These are only indexes, but should contain enough information to find your family member. Cemeteries - These names and dates were derived from Stone reading, Cemetery, Church, and Courthouse records, with better dates from the SSI and obits. Many of the early records are missing or incomplete as registration was not mandatory before 1907. We apologize for any discrepancies in the spelling of names, and some of the death dates from the old records were burial not death dates. This is an index to help you find your family members, and to direct you to the location of residence. Early thru 1919 Deaths - The deaths were indexed from the Courthouse records. Most contain the parents’ names and residence of birth, along with the Volume and page number. "This information is not a legal vital record index. Inclusion of any information does not constitute legal verification of the fact of the event." Intents - The Declaration of Intent was the first step in becoming a citizen, containing the most personal information. The next step was the Petition which was a form containing the immigrants name, two witnesses and the date. The third step was the Naturalization itself. Again a form signed by the immigrant and the Clerk of Court. These records are on film at McMillan Library. Early Biographies - These families are derived from the early 1881 History of Northern Wisconsin, Yellow River Pioneers and Saratoga Sands. Marriages - The marriages are to early 1940 and indexed by Groom and contain the date of marriage and the Volume and page number from the Courthouse. Using the Search engine on the home page will find the Bride. Remember many of the old spellings have changed through the years. "This information is not a legal vital record index. Inclusion of any information does not constitute legal verification of the fact of the event." Births - A work in progress. When completed, they will contain the early births from the Courthouse. "This information is not a legal vital record index. Inclusion of any information does not constitute legal verification of the fact of the event."